Ben Folds at the Warfield. I'm sitting at the kitchen table with Moe. It is just after 10am. He is full of smiles as we are eating breakfast following a very rough night. Moe didn't fall asleep until 10pm, was up screaming and crying at 2:30, then again, just briefly at his usual wake-up time of 7:30. The whole week has been like this, at one moment stressful and difficult, the next full of joy and connection. Moe has been trying hard to communicate with me, leading me places by hand (a behavior the speech consultant suggested we encourage) and even approximating some words: "hu" for hungry, and "wawawa" for what I think was an attempt at water. These attempts to communicate comes with frustration as well, as Moe struggles to tell me what he wants, but is unable to find the right way to tell me. Or, on occasion, I push him to try a bit harder or I just can't give him what he wants at that time. We've had some success with Moe on the potty as well. He's been taking his diaper off over and over again. I think it is almost always just after he's gone. Friday afternoon, I put Moe in his pajamas (the ones with the back zipper that he can't take off) because I was getting so frustrated. 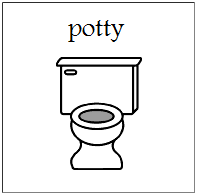 But I am hopeful that this is an early sign of potty-readiness, and I've started putting him on the potty in the evenings before bed. He's gone enough times that I think he knows what you do there, though the understanding that you go there every time, and the ability to communicate that he needs to go (before it happens), are likely a long way off. Still, I'm encouraged. Moe had a lot going on this week. He started a new school and got some vaccinations at his four year old well-check doctor's appointment on Friday. I have to imagine he has a lot to process and hope that his sleep will even out soon. When Moe is sleeping well, the rest usually follows. There were some great moments this weekend, and it seems right to wrap up with those. Jeff and Jelly were both napping on Saturday afternoon so Moe and I had some time to ourselves. He started running up and down the hall, so I positioned myself at one end. When Moe ran toward me, I held my arms out and he reached right up to me (not something he would normally do). It was so cute. I spun him around and he loved it. He ran back down the hall and back to me again and again, until I just couldn't lift him anymore. Saturday night, Jeff had brought home some Yogurtland goodness. It was around 9:30 and Moe was having a really hard time falling asleep. I could see him on the monitor, tossing and turning. We dimmed the lights and brought him to the living room. He sat next to me on the couch, and I offered him some frozen yogurt. He wouldn't take it at first, but after testing the frozen yogurt with his fingers (for some reason he doesn't trust me enough to just take anything I hand him on a spoon), decided that it was awesome. So he snuggled up to me and we shared the rest of the yogurt. He was mellow and sweet, and it was a really nice moment. After the yogurt was done, we put Moe back to bed and he fell asleep pretty quickly. I get really frustrated when Moe can't fall asleep, but we've all had the occasional sleepless nights. When that happens to me, it often helps to get out of bed for a little bit. With Moe especially, I'm always analyzing and solving. Sometimes, it's hard for me to remember that my kids are human too, and may just need what any of us might need: a snuggle, a snack, or a change of scenery. Moe started his new school this week. I suppose it is like summer camp, since he'll be returning to his regular school in four and a half weeks. Yes, I'm counting. I was so nervous for the change. Sunday night Jeff asked what I was afraid of, "that he would get hit by a car?" Frankly, yes, that was one of my concerns. Moe is a runner, and no matter how many times you tell someone "he will take off, he needs a hand always," no one ever seems to get it right away. In fact, that first day as they were showing us where to put Moe's backpack, he darted off to explore the main office, which is connected to his classroom. I think they get it now. I also wanted to know that Moe would be happy and that he would have fun. Would he like the snack they gave him? Would he know the songs? Would he be confused and frustrated having to learn a new system? It is hard to trust your little boy's care into the hands of people you don't know, no matter how kind or capable they may be. I also really want him to make some progress. This is a private (read: not cheap) placement, associated with an autism center. It is also an inclusive program, meaning there may be typical kids in his class. Even though he'll only be there 5 weeks, their approach is slightly different from that of the school district program and I'm interested to see how he responds. This class is only a three hours in the morning, compared to his regular six hour, full day program, so he is still getting a bit of a summer break. I am too since the class starts later in the morning, they provide a snack and I don't have to pack lunch. The downside is that afternoons are longer for me. After three days, he appears to be doing well and participating in the activities. He seems to like the classroom, and they are willing to work with Moe on whatever skills or behaviors we want. I'm proud of how quickly Moe seems to be adapting, and perhaps even generalizing some of the skills he's learned in his regular school to this one. I was also happy to see a familiar face in the class, a little boy who will be in Moe's class in the fall. Moe is exhibiting some behaviors at the new school we only see from him when he's in new or overwhelming environments, like looking up at the lights. When they reported this behavior two years ago at his first placement, I was so worried. Now I know that that is just his way of coping. I guess I've progressed a little bit too. Written as part of Jenny Matlock's Alphabe-Thursday. Today was the letter N.
Raising a child, especially one with special needs, can be very rewarding. But sometimes it is very challenging. So sometimes you need to eat some chocolate. And sometimes you need to get together with your girlfriends and have a good laugh (or cry). And sometimes, you just need to redo your closet. I even have a cool flip-flop hanger. Awesome! I did the design, purchasing, painting and assembled the drawers and shoe glides. Jeff did the demolition, patched some very large holes in the walls, and hung all of the pieces and shelves. Isn't is awesome how I counted several trips to The Container Store as part of the "work" to get this done? I love our new closet! In a Jewish wedding ceremony, the rings are placed on the right index finger. As with everything Jewish, we don't really know the reason why, and we can bicker about it all day. Uncertainty is in our genes. We get around this by giving a few possible reasons, then getting something to eat and forgetting about the question. The rabbi at last weekend's wedding described two reasons for this custom. The first is that moving the ring from one finger to another is a deliberate act. So, the groom places the ring on the bride's index finger and she moves it to her ring finger, signifying her willingness to enter into this marriage. Think of it as the ancient equivalent to "check here to agree to the terms of service." In fact, there seems to be a lot of emphasis in the Jewish wedding ceremony on not getting tricked into marrying someone. The reason for this is (surprise!) up for debate, but often refers to the story of Rachel and Leah. The other reason we place the ring on the right index finger is that Talmudic rabbis agreed that this finger had the most direct connection to the heart. Clearly the more romantic spin on the custom. Parents of children with autism understand the significance of the index finger. Pointing, or rather the lack of pointing, is a primary marker of autism in young children. When Moe was first being screened our pediatrician asked if he pointed at things, and we answered "Maybe? Sometimes?" Now that we've watched our typical daughter, Jelly, enthusiastically point at everything since she was at least 9 months old, we know that our "I don't know" should have been an emphatic "no." For her, pointing was a developmental imperative, one she worked on as vehemently as rolling over, crawling, and walking. Every couple of months, I come across a set of pictures from a party when Moe was about 18 months old. He had just started walking, the only delay I had been concerned about at the time. In the photo, Moe is clearly pointing at the camera. And though I can remember hardly any examples of "shared attention" or other efforts to point out things he was looking at (other than a short time when he would point to body parts, letters, or pictures in books when we asked), I always come back to this picture. It was my "proof" that he was okay. In some ways, this picture makes me hopeful. If Moe had this instinct to point at one time, it must still be in there. The "it" I'm referring to is not the pointing; rather, "it" is the typical boy I still sometimes long for and imagine, though I will myself not to. Somehow, knowing that Moe was once doing typical things helps me feel like he can get there again. I convince myself I'm not asking him to be something he never was, but just to get back to the way things were. On the other hand, the fact that I have exactly one picture, one memory, of Moe pointing, is a real indication of how early the signs of Moe's autism were present. Despite the regressive nature of his autism, at least as far as language development, there were many early signs. And this realization tells me how, for lack of a better word, "deep" his autism runs. Though Moe will learn many skills, perhaps even the skill called "how to grow up, get a job, move out and otherwise get along in society," he will always and forever be autistic. And if Moe's index finger is, as the rabbis say, a direct connection to his heart, what does it mean that he still, at age 4, doesn't point? If Moe doesn't share his experience in this way, doesn't see the point (pun intended), does this mean that he does not share his heart? Of course there are other ways to share experience and to express love. For one thing, parental love is about giving without expecting anything in return. And if, as we say, Moe's autistic brain is wired just a little differently than mine, then maybe other connections are as well. If Moe's finger isn't directly connected to his heart, I can certainly tell you that it is connected to mine. As my fingers point, sign, squeeze, brush, hold, direct (and re-direct), I share Moe's heart every day. Besides, I'm pretty sure for Moe, the most direct connection to his heart is his smile. Unfortunately, it's hard to put a ring on that. For today's Alphabe-Thursday post, I'm going to recycle a post from the very beginning of this school year, Moe's first year in preschool. Click on over to read The Magnificent Mrs. M.
Last weekend I went to LA for a wedding. I first knew the groom as the little brother of one of my best friends from Hebrew school and then high school. A few years later, he and my brother became very good friends. Now, more than 25 years later, our families are, well, like family. My parents have come to adore this bride and groom, and since they are local, spend time with them at Dodger games and other events. My dad expressed that this wedding, and the people involved, are important to him. He and my mom had the honor of signing the ketubah (Jewish marriage contract). The ceremony itself was on the helicopter pad of a hotel in Marina del Rey, with a glorious panoramic view of the city, from the ocean on one side, sweeping around through downtown and beyond. The bride and groom stood under a custom chuppah (canopy), made from pieces important to them, including a shirt my brother got on a cross-country trip they took together to the Baseball Hall of Fame. As the chuppah flapped in the wind, I caught glimpses of the words "Field of Dreams." But this weekend wasn't just about the wedding and old friends. It was also about making new connections. On Saturday morning, I had breakfast with my blogging friend, Cheryl from Little Bit Quirky. The time flew as we chatted about our kids, about our plans for the upcoming BlogHer conference in San Diego, and about the future of our blogs. I'm looking forward to spending more time with Cheryl; I just hope she survives Carmageddon. And then I met Kerry. Kerry is a frequent commenter on this blog, though not a blogger herself. She has a child right around Moe's age, who is also on the autism spectrum. Our kids are remarkably similar, and though we had never met before, we felt like kindred spirits. Kerry's husband was in the wedding, so I knew she'd be there early. She was by the door when we walked in, and we were inseparable from that moment. Kerry is a true warrior mama, kind and caring and fiercely determined to do everything she can for her son. We lamented the fact that we lived so far away, swore we'd find a way to get our kids together soon, and I know we'll be great friends always. I also spent some time with my friend (the groom's sister) and her husband. She is very pregnant, and was given the day off from modified bed rest to attend the wedding. She had to take it easy (i.e. no dancing) so we had plenty of time to catch up. Yesterday she went into labor! I'm still waiting for word of the delivery. It's earlier than they had hoped, but still should be safe, and now I'll get to visit that little baby when I'm in San Diego in August! I met or reconnected with a number of other wonderful people, friends of the groom's and of my brother's. I'm thankful that Facebook will allow me to keep in touch with them moving forward. The rabbi described the second cup of wine the bride and groom drink during the ceremony as the "cup of joy." Surely, my cup runneth over. This weekend I'm going to a wedding. The wedding is in Los Angeles, and I'm traveling without my family. I'd be lying if I said I wasn't looking forward to a couple days away from parenting duties. The groom's sister is one of my oldest and closest friends, and because she is pregnant and must take things very easy, there should be ample time to talk. One of my blog readers who has a son very similar to Moe will be at the wedding too, and can't wait to meet her. I am also going to have brunch with the very fantastic Cheryl who blogs at Little Bit Quirky! Although I will have friends as well as my parents at the wedding, unfortunately Jeff won't be there. Because my parents will be at the wedding too, we didn't have a babysitter for the kids. The expense of travel and the stress of finding a babysitter who could handle a non-verbal, trouble-making, autistic child at an unfamiliar place, plus figuring out the various sleep requirements, seemed like a lot of effort for a short weekend visit. So we decided I would go myself. One of my primary motivations for getting Moe to be able to sleep in a regular bed is so that we can travel, even just a little, and visit my parents more often. I'd like the kids to know their grandparents' house. I think a bed and a bed tent will work, but I want to experiment at home first. So, yes, I'm looking forward to a couple of nights of not being woken up by whining or crying or squealing. I'm looking forward to seeing my friends, having a drink (or a few) with no responsibilities. I'm looking forward to a plane ride all by myself. I'm looking forward to some time without the kids. But I'm also looking forward to the day when I can bring them along. Last week's stomach bug and the summer heat seem to have knocked Moe off his axis a little bit. Much to my dismay, Moe's sleep issues have returned, and he hasn't slept through the night since Friday. I hope this is short-lived but whenever I'm sleep deprived, I tend to think the worst. We'll never sleep a full night again! You may remember that we stopped giving Moe melatonin a few months ago. He had been waking during the night and we wanted to try an experiment. As expected, Moe had more trouble falling asleep, but he was not waking during the night. We were all much more rested. But the last four nights, Moe has woken up in the middle of the night and been up for several hours. Our air conditioning's lackluster performance this summer certainly hasn't helped. All last week and into this week has been full of ups and downs. Saturday we had a really nice lunch out, then went to Tap Plastics to buy some boxes for the 3D choice board. We are also (once again) rearranging things in the house to better make Moe's toys and books "in sight but out of reach." Moe can open most boxes and can climb really well, so Jeff was interested in trying to make some clear boxes that Moe can't open without help. We bought some cool pieces of acrylic remnants ($1 a piece!). They are still sitting in my car. Sunday we went to the pool. Moe slept in so we went a little later that we usually do. We were excited because that meant that the mushroom would be on, and we had never played in it before. I thought Moe would love it. He didn't. He seemed a little afraid of it, and was actually quite anxious in the water, clinging tightly to me or Jeff. This is new and unusual behavior, and I'm not sure if it was caused by the sound of the mushroom, which streams quite a lot of water, or just his mood. Water can be overstimulating for him if he's tired or not feeling well. So he tolerated the pool for a while, but we didn't stay long. Jelly, although also terrified of the mushroom, enjoyed the pool quite a bit and I had her sitting on the edge and jumping to me, as well as holding on to the side and kicking her legs. She's going to be a swimmer in no time! We thought about going to the Monterey Bay Aquarium on Monday, but Moe, having been up much of the previous night, slept in quite late. We had a mellow day, but I found it a little depressing. I remember so many fun Fourth of July outings when I was growing up, including parties at our own house and block parties with relatives. Jeff reminds me that the kids are still very small, but I see the kinds of things my friends are doing and I know we just aren't there yet. I wish it didn't bother me, but it does. We had a fantastic fireworks show from our back yard, however, and brought Moe (who wasn't sleeping anyway) out to see them. He seemed to really like them. Jelly, for once, fell asleep early and I was not about to wake her up, especially for something that might have been scary for her. After we put Moe back to bed, I went into the front yard, where the view was even better. I caught glimpses of at least 3 or 4 fireworks shows from surrounding areas. I have no idea where they all came from. Next year, I think maybe we'll have a party at our house, and invite everyone out to the front lawn for the fireworks display. I'm realizing more and more that if it is too hard to go to things with the kids, we'll just have to have everyone over here. Of course, next year may be a whole different story. Hope you all had a safe and fun holiday weekend! I slip on a yellow paper gown over my clothes, snap on purple gloves: the protocol in this hospital room. My friend is there in the bed, her hair cut very short, to minimize what will be falling out. I chat with her husband. He gives me brief instructions before leaving: make sure she eats something. He has been running on empty for weeks. The room is filled with pictures of family and friends. A hydrangea is on the table. I wish I had brought something pretty; last time we were not allowed. I add the tabloid magazines I brought to the stack already on the table. On the wall, I notice a bio-hazard container. The warning shouts "Chemotherapy drugs. Incinerate! Incinerate!" This poison that they inject is too potent for the standard needle receptacle. I sit in the chair. I don't know what to say. She pages the nurse for nausea and pain meds, but the nurses are slow. She pages again. Eventually the pills arrive. The nurse draws more blood. I remove my gown and fetch a Popsicle. I fill a pitcher with water and ice. We take a walk in a garden too beautiful to be in a hospital. She looks better when we're outside. I give a brief tutorial on the iPad. I can be useful that way. We tell stories of the past, of how we met our husbands. We talk about vacation plans for the summer. Neither of us have any, for entirely different reasons. We run into an acquaintance who is there visiting her brother. Colon cancer, but it is spreading. I cannot remember her name, and I make an awkward introduction. She is tired and we return to the room. I pause to put on another gown and gloves. She pages the nurse to reattach the IV. She asks for more pain meds; they will need to page the doctor. I rub her back a bit. It is awkward with the gloves on. I arrange blankets as she settles in to sleep. I take the gown and gloves off, text her husband that I am leaving. Give him the status of the pain meds. He'll be back for the overnight shift. From the doorway I say goodbye. Promise to come back soon. I search for the right words. On Wednesday, I dropped Jelly off at my BFF's house, and met Jeff and Moe up at Lucille Packard Children's Hospital. We were there for speech evaluation with a woman recommended by Dr. S, our developmental pediatrician. I was thankful we were at a satellite building of LPCH; I find it hard to walk through the hospital without having my heart break a little for all the sick children there. Even when I was arriving to deliver my own children, happy days both, I had to keep my eyes down. I arrived first and filled out some paperwork. Jeff and Moe walked up and Moe, already holding Jeff's hand, reached up and grabbed mine with the other. He was apprehensive at the waiting room, despite the TV, toys and books. This hesitation is something new, and I think positive, showing a little more awareness and concern for where he is and what might happen. But Moe stayed calm, and we were shown back to a room. 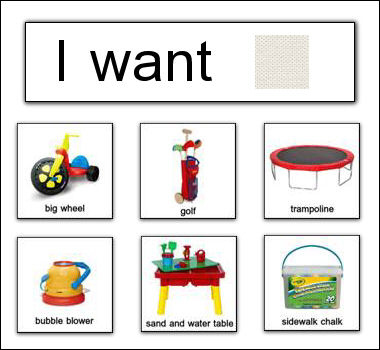 The SLP we met is a specialist in augmentative communication, or communication without speech. She had already reviewed Moe's latest reports and IEP and knew his background. She worked with Moe in a few different ways, and we thought he did really well. A year ago, Moe would have spent much of the time trying to leave the room, grabbing us by the hand to open the door. This time, Moe sat at the table for the entire appointment, engaging with the SLP, making requests and taking turns when prompted. Most of the readers of this blog should be familiar with the Picture Exchange Communication System, or PECS. 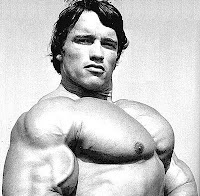 If you don't know about PECS, the concept is simple: instead of speaking a word to communicate something, a picture, often a graphical icon, is used. So if Moe wanted to play, he could grab the "play" icon and hand it to me. This can be done more simply to give choices; for example, at school he might be asked to point to one of two or three icons representing which song he wants to sing at circle time. 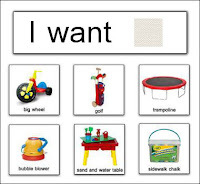 In a more advanced form, multiple icons can be used to form sentences: the icons for "I want" and "eat" can be put together, for example. The SLP used a different form of exchange with Moe, using 3-D models instead of icons. She had beads in a clear box and balls in another box. These were used as models. She then had another set of beads and a ball in her hand. She gave Moe the ball and let him play. She then said "my turn ball," pointed to the ball in the box, then held out her hand for Moe's ball. He handed it back. She did this with the beads as well, just to get him familiar with the two toys. Then she waited for Moe to make a choice. He had to point, unprompted, to the item in the box he wanted, then he would get the real thing. He understood the concept quickly and we added in more items to choose from. He started to tune out when there were 4 or more choices. We then switched to pictures of the items, instead of the 3D versions in the boxes. Moe did okay with this, but not quite as well. He did better when the picture was held up at an angle, rather than flat on the table. We tried a few more variations with different types of equipment as well. Moe also did some nice verbal imitation playing with a microphone toy. We haven't had a lot of success with PECS in the past. Although I know Moe understands the basic concept, we haven't gotten much past the pointing to a choice stage. We have had a little more success with sign language, but the motor planning required to make the signs is difficult for Moe. PECS has the benefit of being understood by anyone (the words are printed under the pictures), but can require carrying around a large PECS notebook. Signing is more portable, but not universally understood. As part of our PRT work, we've also been phasing out signing with Moe in favor of verbal attempts and this seems to be working. Moe will almost always make a verbal attempt when prompted. This is not a verbal approximation; right now, any sound will do. But this week I am starting to require more of an approximation for a few words that have high value and are easy to say, like "up" and "open." I was a little disappointed after the evaluation. Every time we meet with someone new, I'm so hopeful that this person will be the one to discover the key to Moe's speech. I want someone to be able to look at him and tell me, do X, Y, and Z and he'll start talking. I know it doesn't work that way, but I hope anyway. We are now able to come back to see this SLP, and it is nice to have another expert on the team. The SLP did confirm apraxia of speech, meaning there are motor planning issues in addition to the issues of understanding social communication. This is not news, though I don't think has ever been in any kind of formal assessment before. She recommended we start with the 3D models, then move to photographs before using the graphical icons. We'll be spending the weekend getting set up for that. But primarily, she said to keep doing what we're doing. There is no easy answer here. Just time, hard work, and a lot of patience.